CRC-9 opened for its second day on Wednesday, 23 October 2013, with news of the appointments of new Bureau members: Boniface Mbewe (Zambia) for the African Group; Amal Al-Rashdan (Kuwait) for the Asian and Pacific Group; Magdalena Frydrych (Poland) for the Central and Eastern European Group; Gilberto Fillmann (Brazil) for the Latin American and Caribbean Group; and Jürgen Helbig (Spain) for the Western European and Others Group. The Committee then heard progress reports from the Co-Chairs of the contact groups on lead arsenate and methamidophos. Michael Ramsay (Jamaica), Co-Chair of the task group on fenthion 640 ULV, reported that the group concluded that Chad's proposal to list fenthion 640 ULV as a severely hazardous pesticide formulation (SHPF) meets the Rotterdam Convention’s criteria for listing. 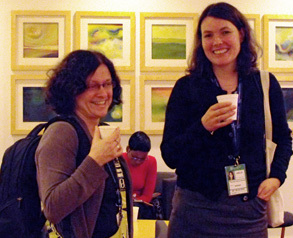 A contact group co-chaired by Ramsay and Anja Bartels (Austria) was established to draft a rationale for the decision. Leonarda van Leeuwen (The Netherlands), Co-Chair of task group on lead carbonate, reported on the group's review of notifications from Latvia and Jordan. The Committee accepted the group’s recommendation that neither notification meets all the criteria set out in Annex II to the Rotterdam Convention and therefore should not be proposed for listing. The Committee considered, and took note of, the Secretariat's report on activities for effective participation in the work of the CRC. During lunch and the early afternoon, the contact groups on lead arsenate, methamidophos and fenthion 640 ULV met. When plenary reconvened at 4 p.m., the Secretariat introduced the draft decision on trichlorfon, which the CRC adopted without amendment. The Secretariat then introduced the draft decision and draft rationale for methamidophos and the draft work plan for the preparation of the draft decision guidance document. 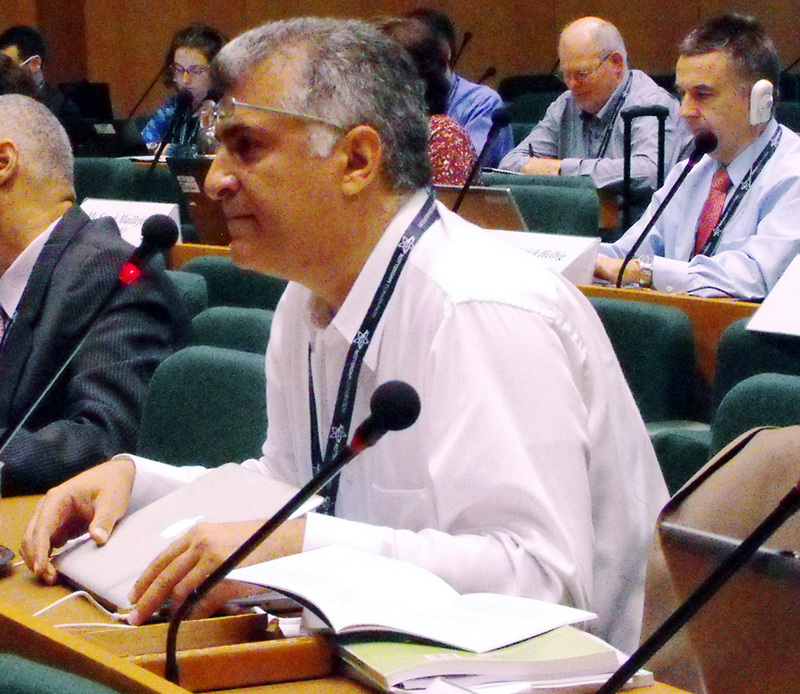 At the request of a member, Chair Al-Easa agreed to postpone a decision until Thursday morning so all members would have a chance to fully review the documentation. The Secretariat also introduced the draft rationale and decision on fenthion 640 ULV, and the Committee agreed to defer its decision to Thursday morning to allow Committee members time to review the documents. In the evening, the contact group on lead arsenate continued editing the draft decision rationale with a view to finalizing it for the Committee's consideration on Thursday in plenary. 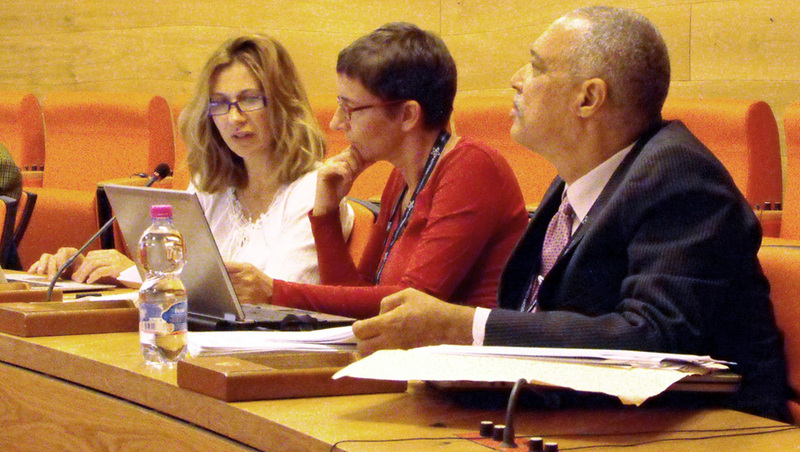 Elisabetta Tagliati, the Secretariat; Anja Bartels, Austria; and Michael Frank Ramsay, Jamaica, work on the decision rationale for fenthion 640 ULV in the contact group. 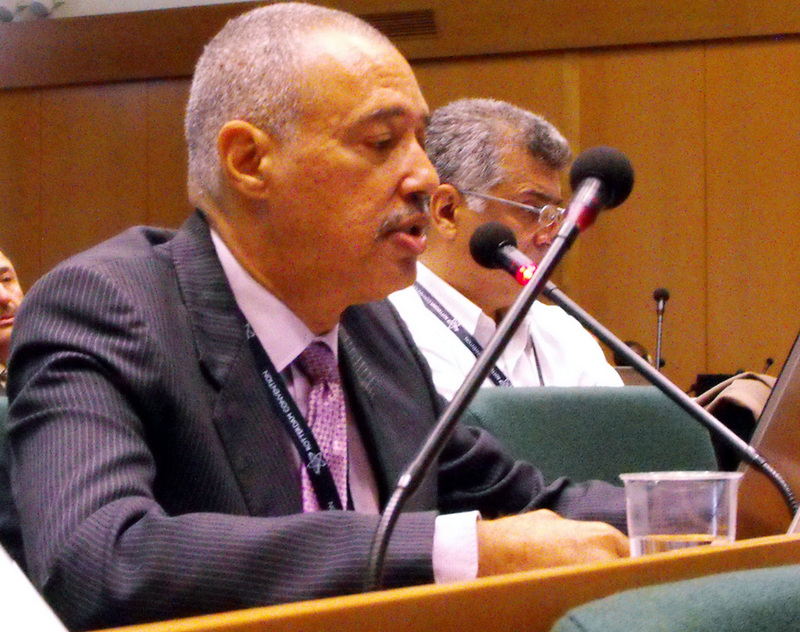 Michael Frank Ramsay, Jamaica, presents the task group report on the proposal to list fenthion 640 ULV as a severely hazardous pesticide formulatiion. 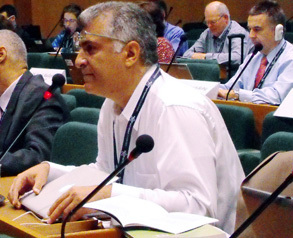 Mehdi Ghaemian, Iran, asks a clarifying question during the Committee’s discussion on fenthion 640 ULV. 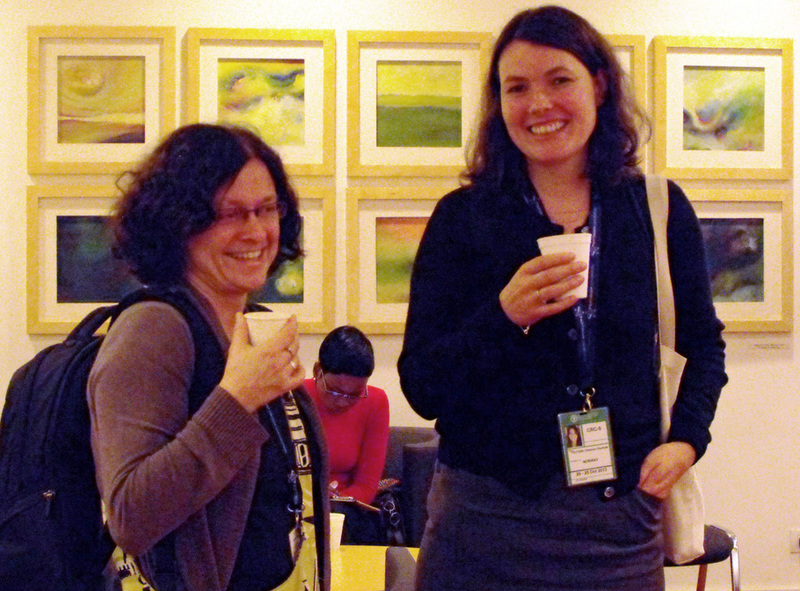 L-R: Trine Celius and Christina C. Tolfsenfs, observers from Norway, enjoy a quick coffee break before contact groups reconvene. 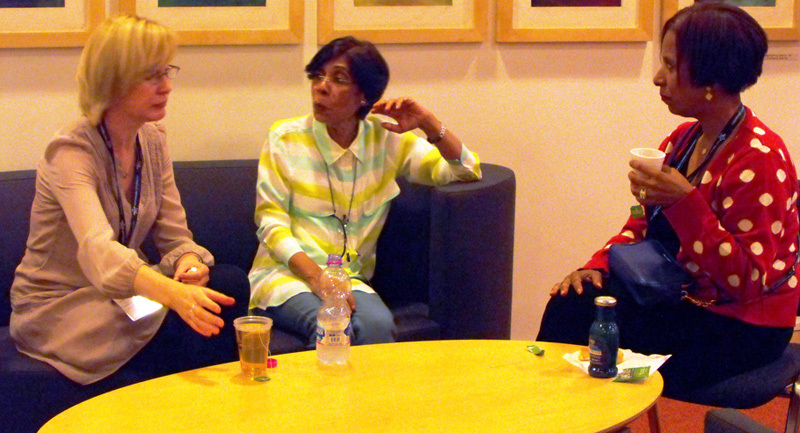 L-R: Magdalena Frydrych, Poland; Chair Al-Easa, and Amal Al-Rashdan, Kuwait, discuss the CRC’s progress before plenary reconvenes.